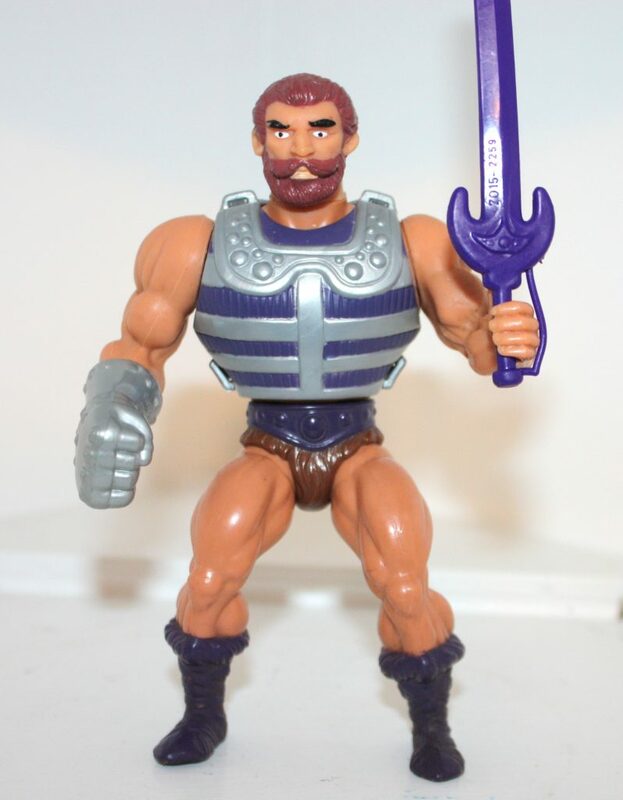 My introduction to Fisto came in first grade, when a classmate pulled out several of his newest He-Man figures to show the rest of us. 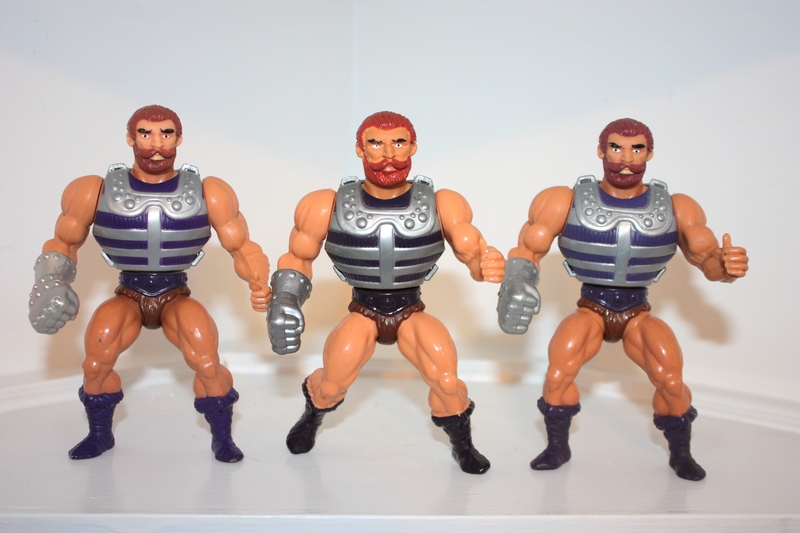 The three figures I remember him showing us were Tri-Klops, Jitsu and Fisto. 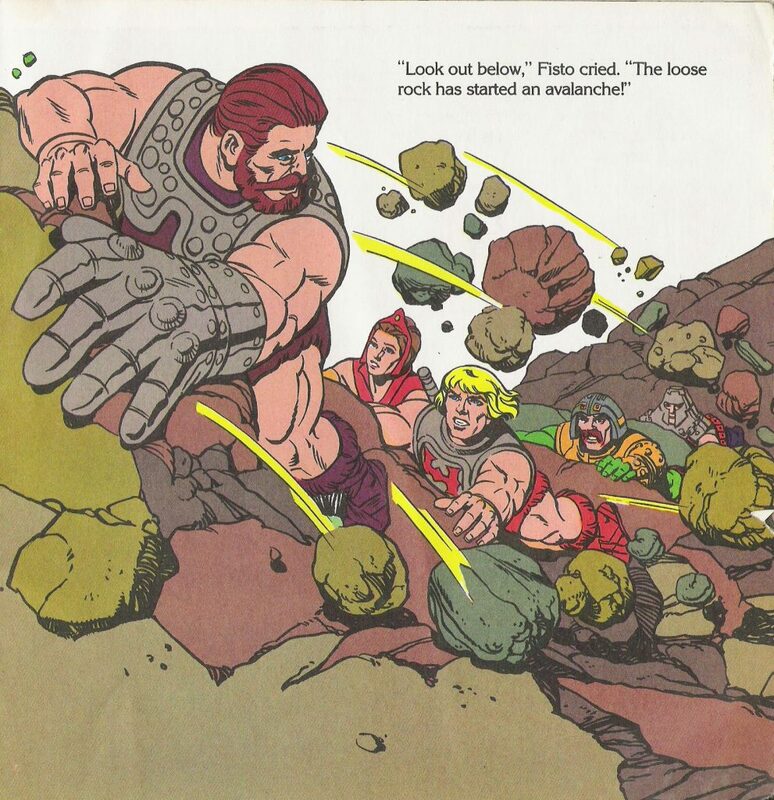 I already owned Tri-Klops from way back in Kindergarten, but I hadn’t seen these two new figures with their spring-loaded right arms that terminated in either a giant metallic fist or chopping hand. The entire group was suitably impressed, and we each took turns testing out their action features. 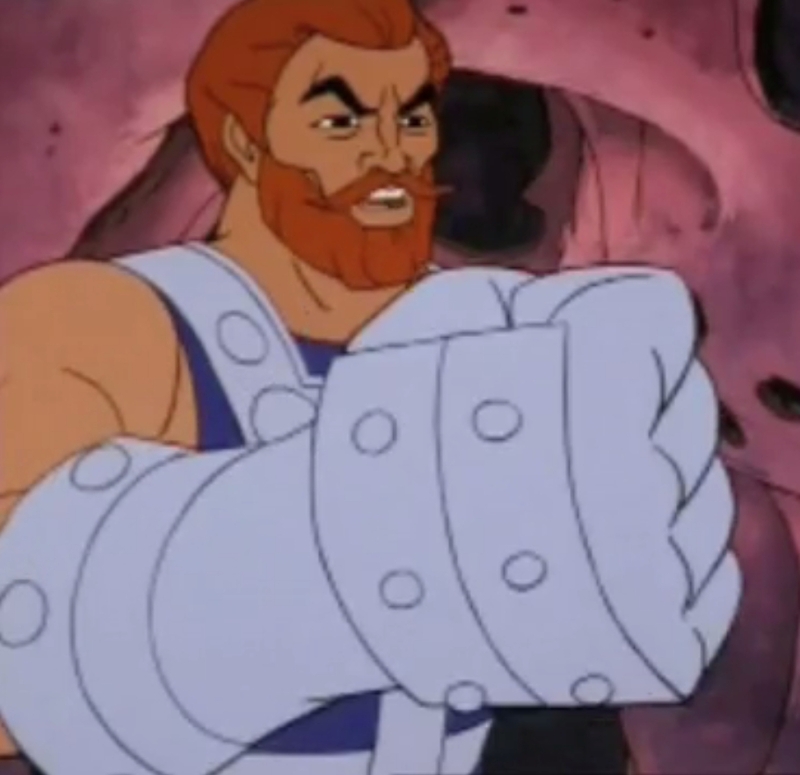 In the commercial above, Fisto is pitted against Clawful, another character from 1984 with an enlarged right “hand”. I don’t know if that’s because the Jitsu action figure wasn’t quite ready yet, or if they thought that Clawful would sell more. 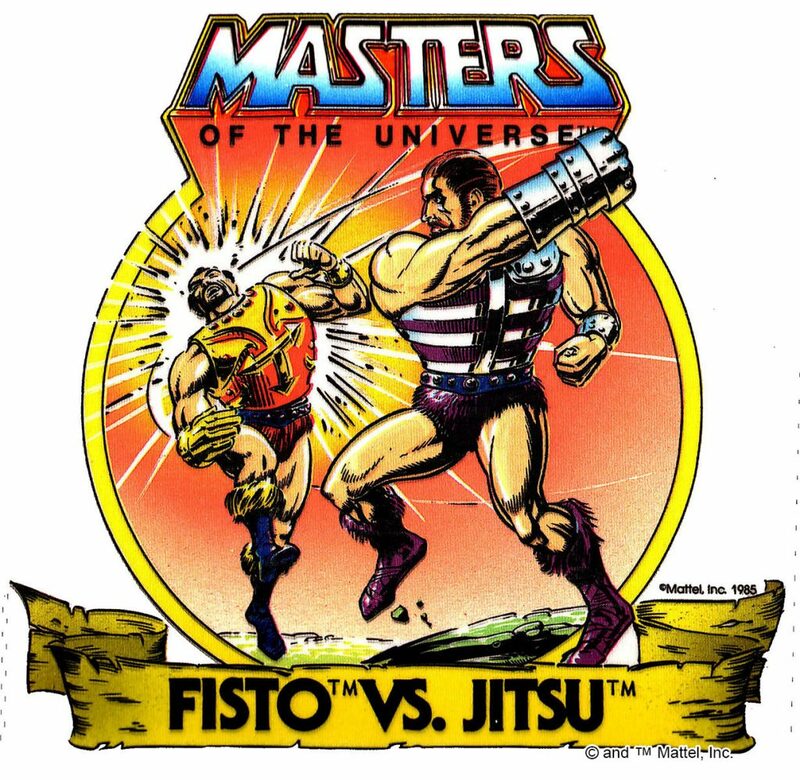 Jitsu seems like a more obvious nemesis for Fisto. 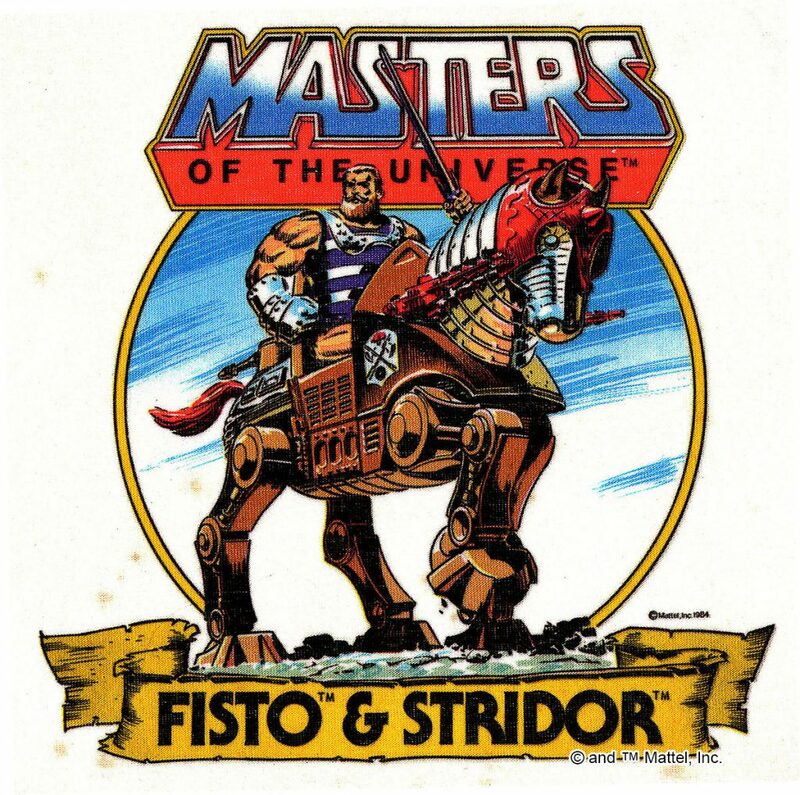 Fisto was created by Mattel designer Colin Bailey (see: my interview with Martin Arriola). 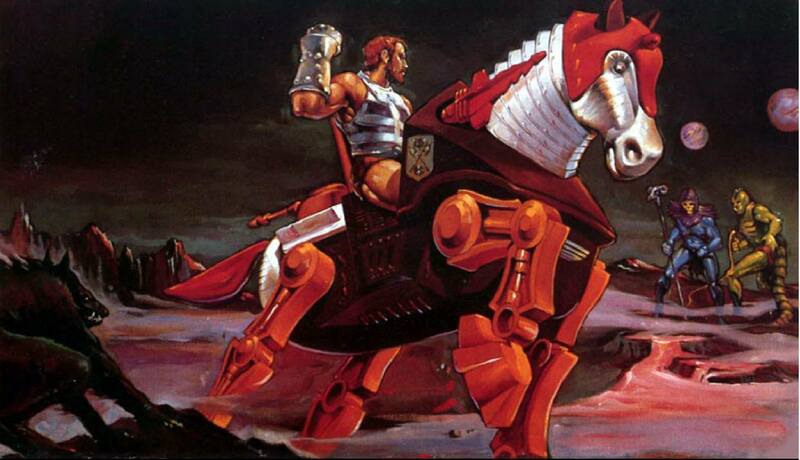 Although no concept art for Fisto has been either found or at least made public, there is an image of his prototype. 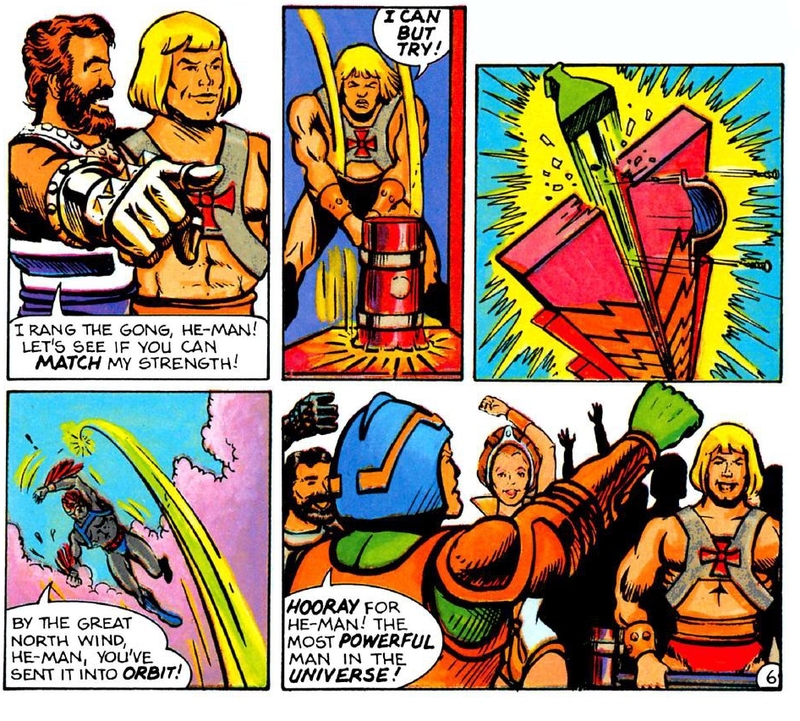 The image below, which can be found on both He-Man.org and Masters Unbound, shows a prototype built around the basic He-Man buck. The sculpt for his metal fist and armor is a bit rough, with noticeable divots and irregularities. He seems to have larger eyebrows compared to the final toy. 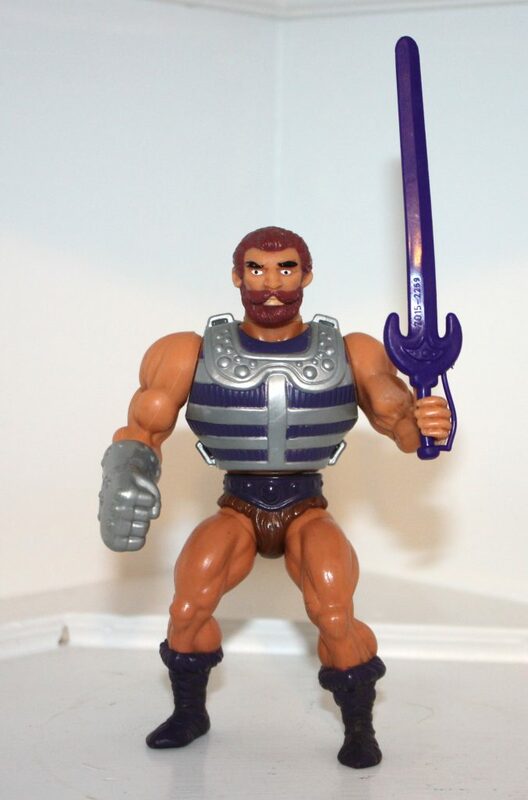 This version also has the standard He-Man arms. 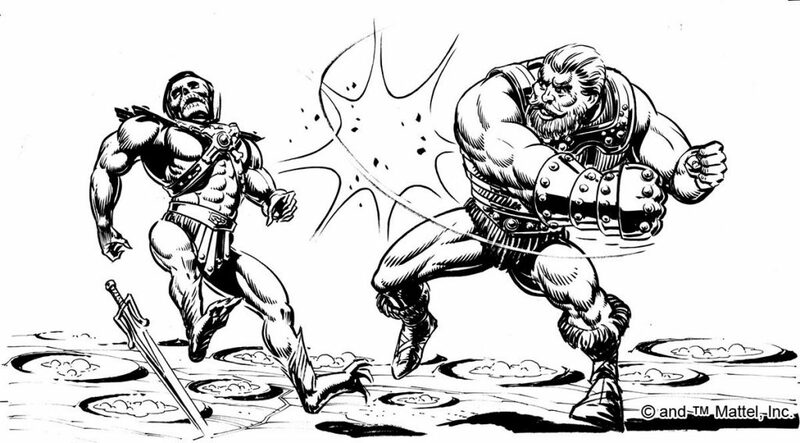 The final version of Fisto would have enlarged deltoids to accommodate the width needed for the spring-loaded arm mechanism. He would also be given a closed left hand to allow him to better hold his sword. 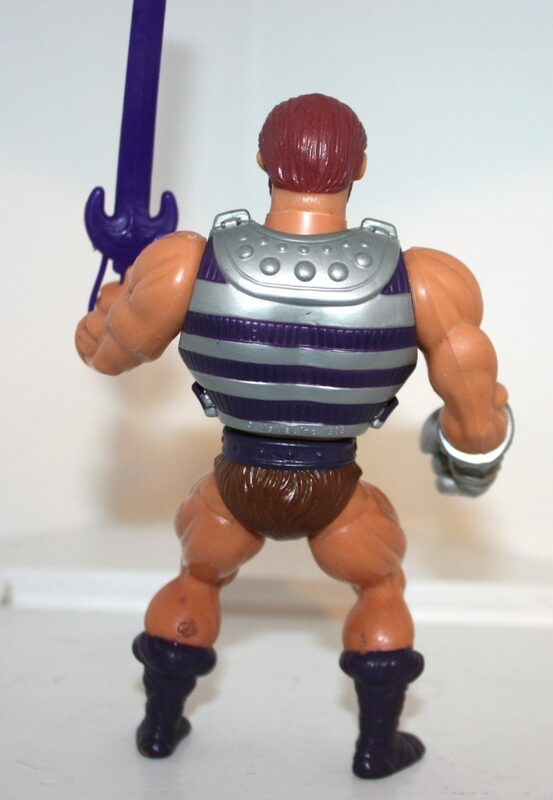 In this case, the sword is an unmodified copy of Tri-Klops’ sword, but the final toy’s sword would be cast in purple. 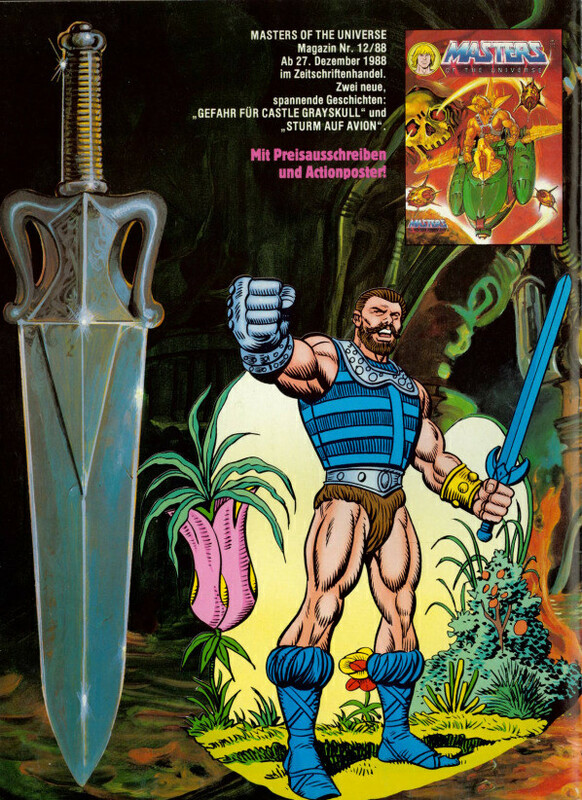 The sword, I think, is an odd choice, given the figure’s action feature. 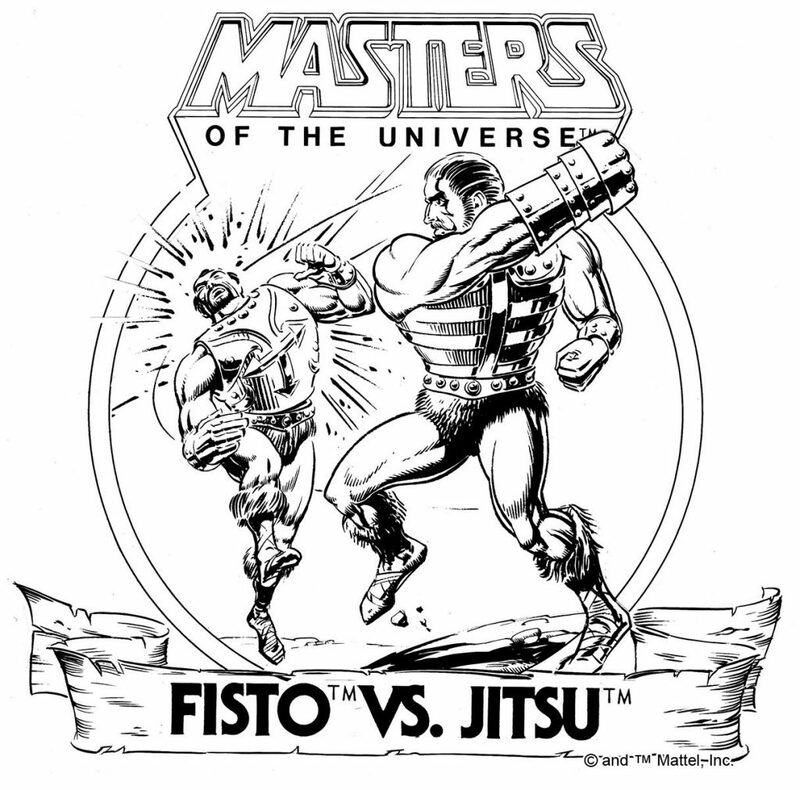 I would think a blunt weapon, like a mace or a hammer, would be better suited to Fisto’s fighting style. There were also a couple of versions that came with a purple Jitsu sword. 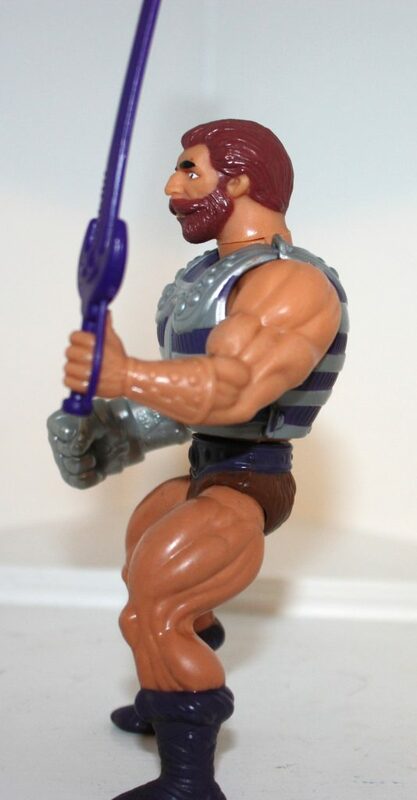 Fisto was sold in a JCPenny two-pack with Buzz-Off. 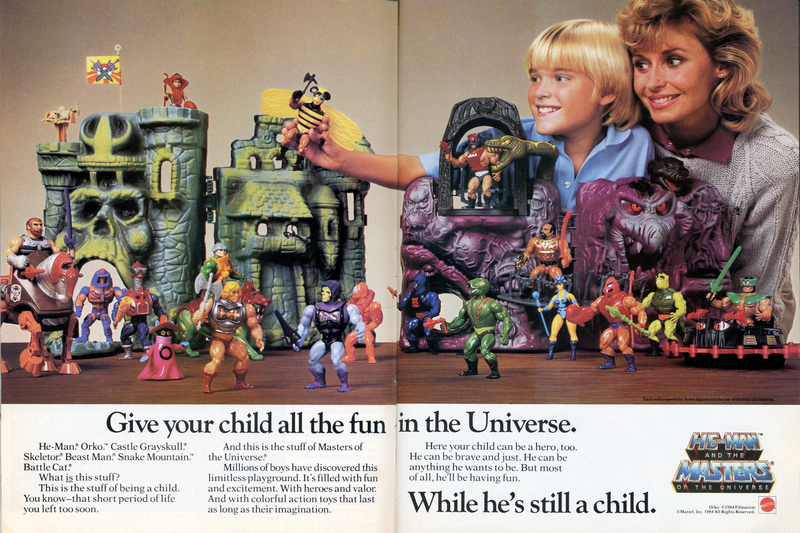 The box had minimal artwork – the black and white line art that Mattel shipped out to retailers for use in ad copy. 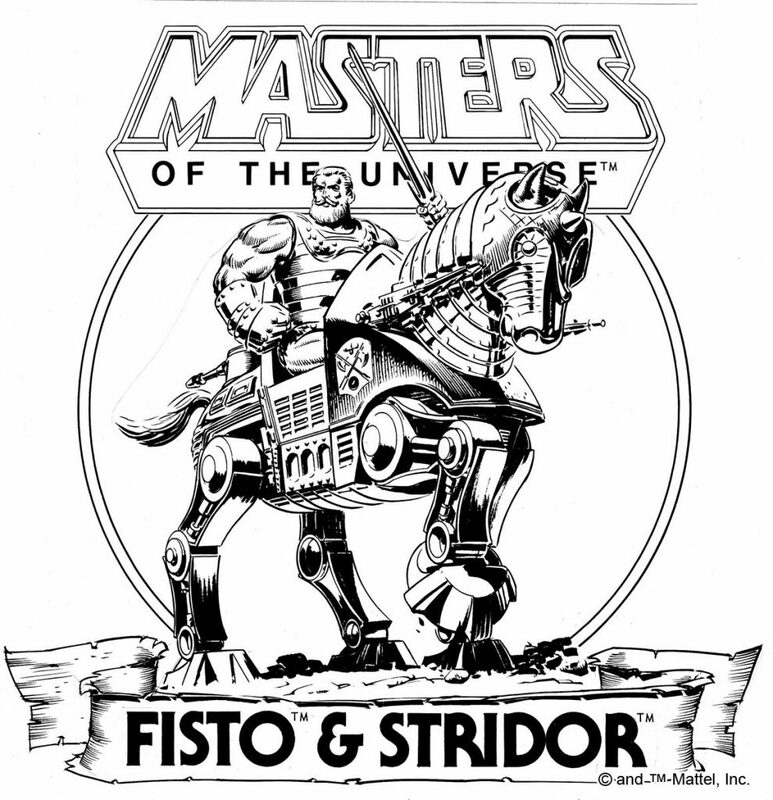 Fisto was also sold in a gift set with Stridor, with great piece of artwork that seems to have been illustrated by William Garland, based on its style. 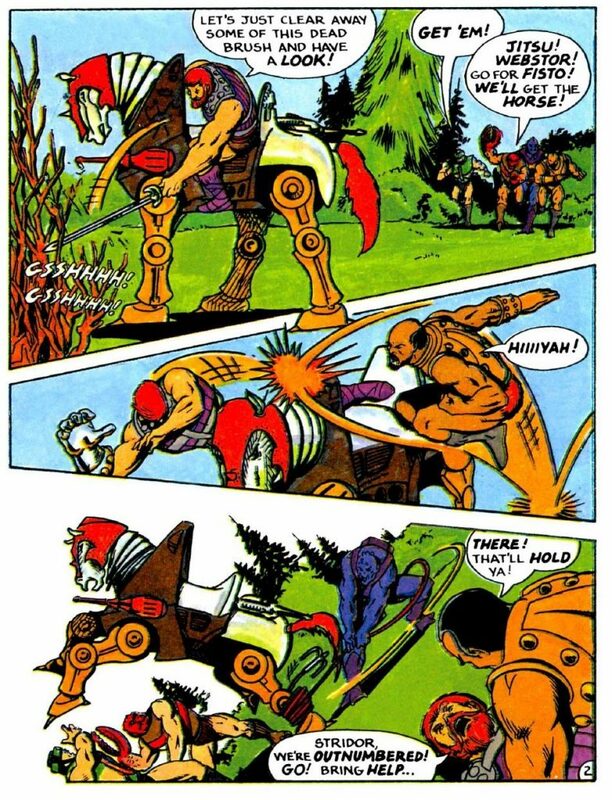 In the story, Fisto, riding on Stridor, is ambushed by Clawful, Tri-Klops, Webstor, and Jitsu. 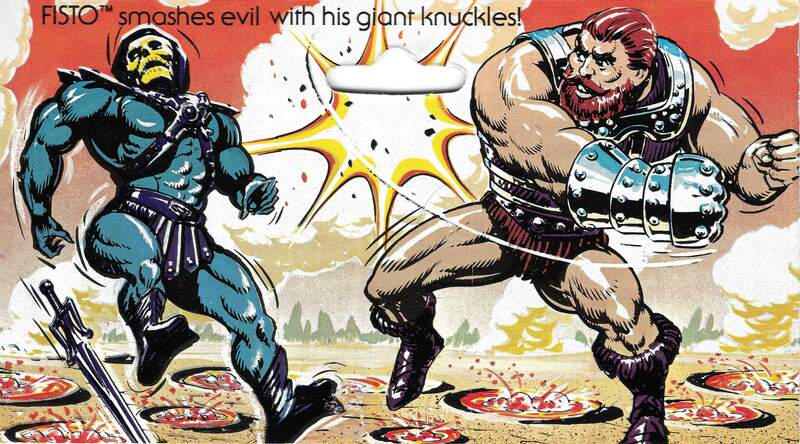 He is captured and forced to fight for his life in Skeletor’s arena. 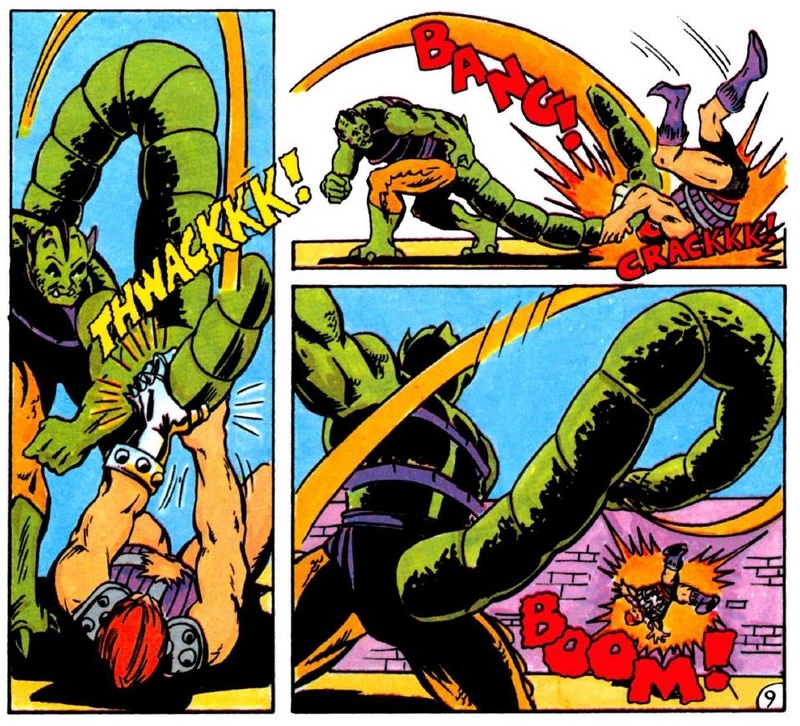 He’s successful in beating off Clawful and Jitsu in turn, but Whiplash nearly spells the end for Fisto before He-Man comes in and breaks up the fight. 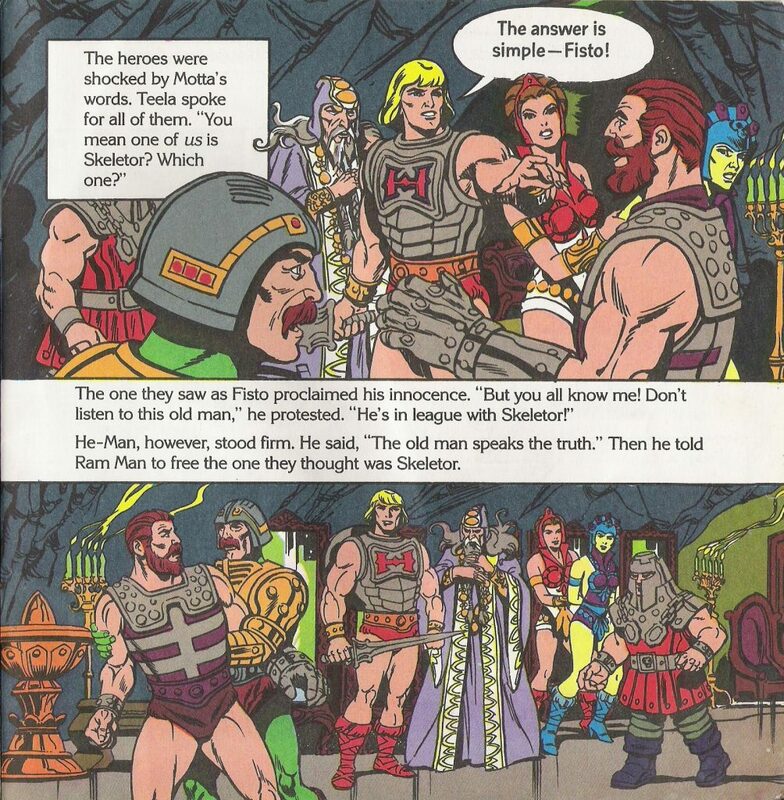 Another notable Fisto story in the mini comics is Masks of Power. 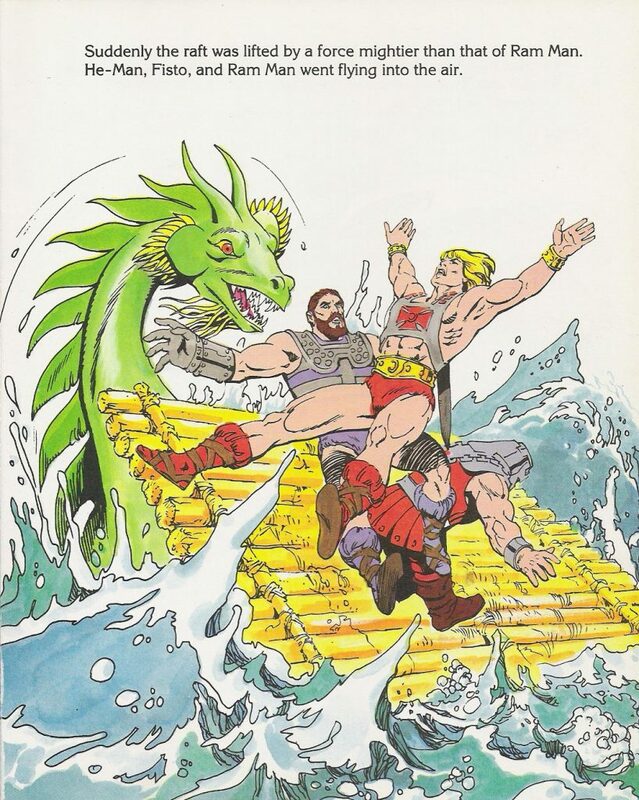 In this tale, Fisto and He-Man are obliged to team up with Mer-Man and Skeletor to stop two little demons who have stolen powerful masks and threaten to take the power sword. 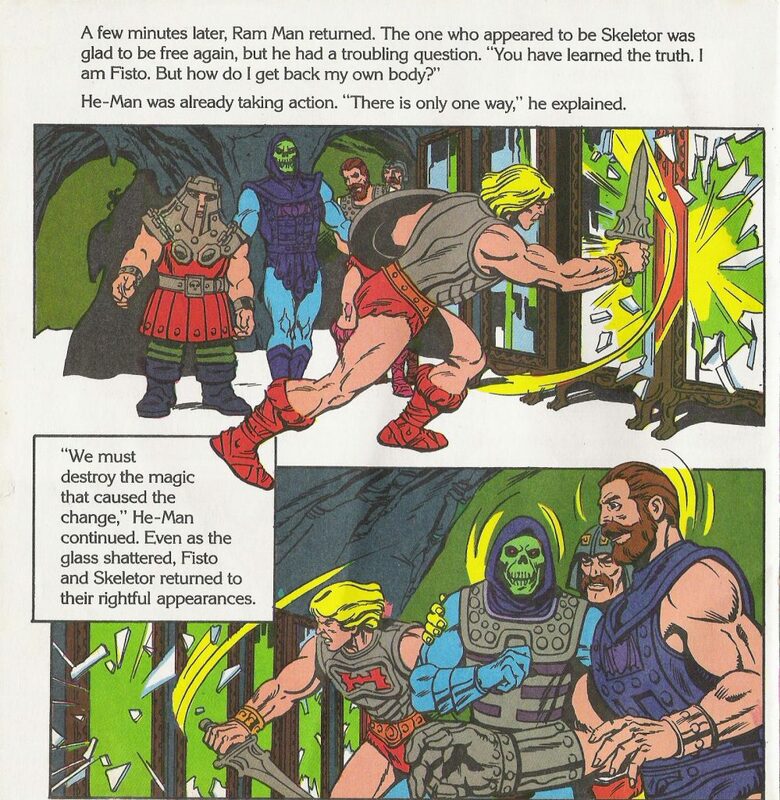 In The Magic Mirror, Fisto is replaced by a mirror image duplicate (Skeletor in a magical disguise). 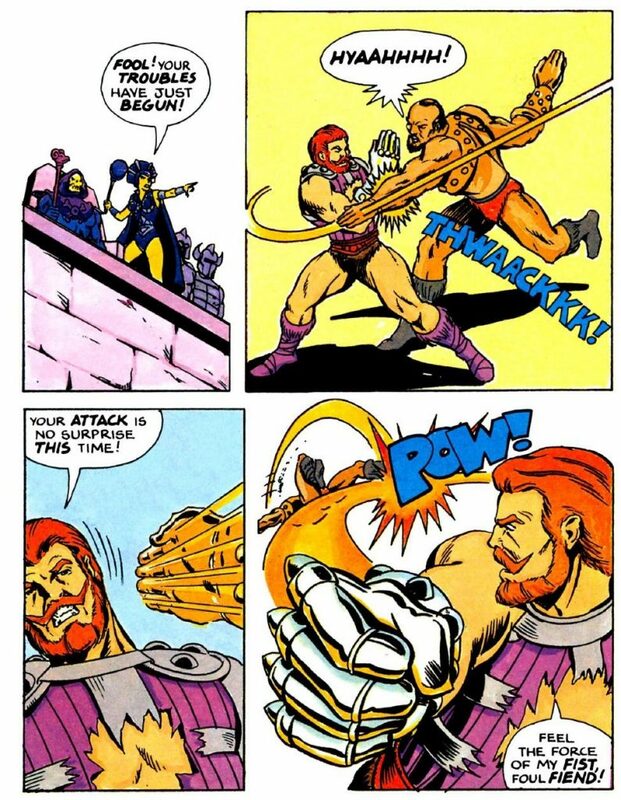 Skeletor is discovered when He-Man notices that “Fisto’s” steel fist is on his left hand rather than his right. 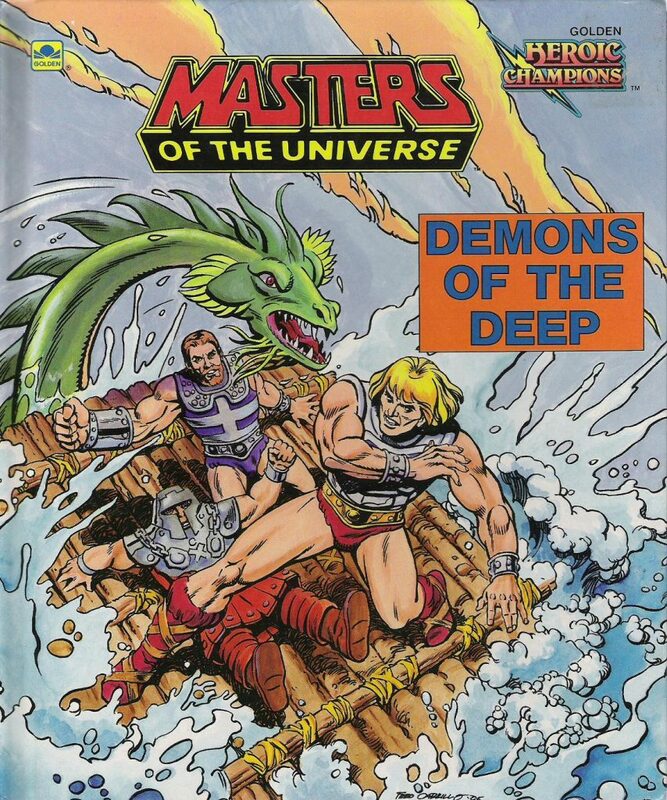 In Demons of the Deep, Fisto, He-Man and Ram Man discover an underwater duplicate of Castle Grayskull inhabited by Skeletor, who controls some nasty robot sea monsters. 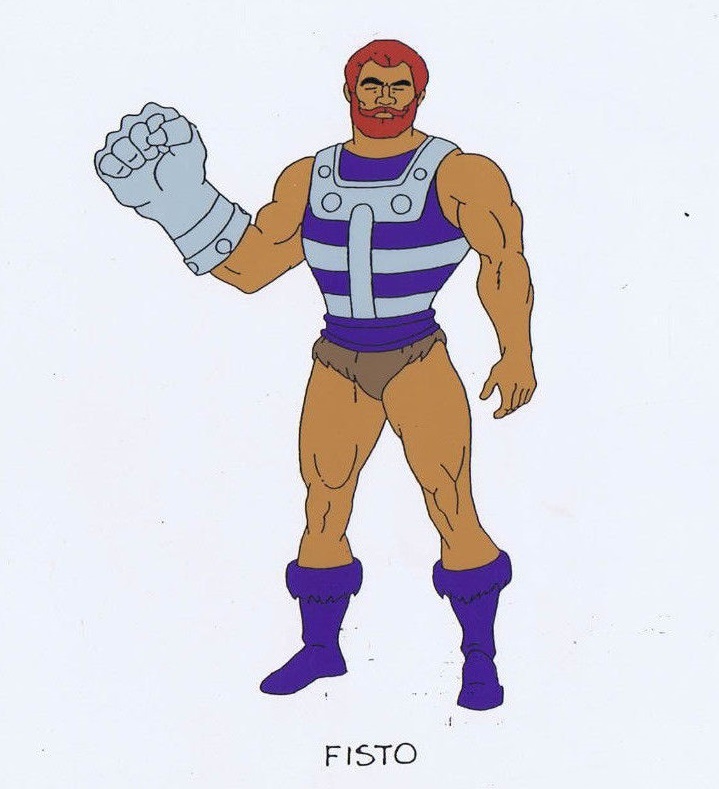 In the Filmation He-Man cartoon, Fisto’s design is, as usual, simplified for animation. The most noticeable change in design here is that he is given an enlarged fist even compared to the one on the Mattel toy. 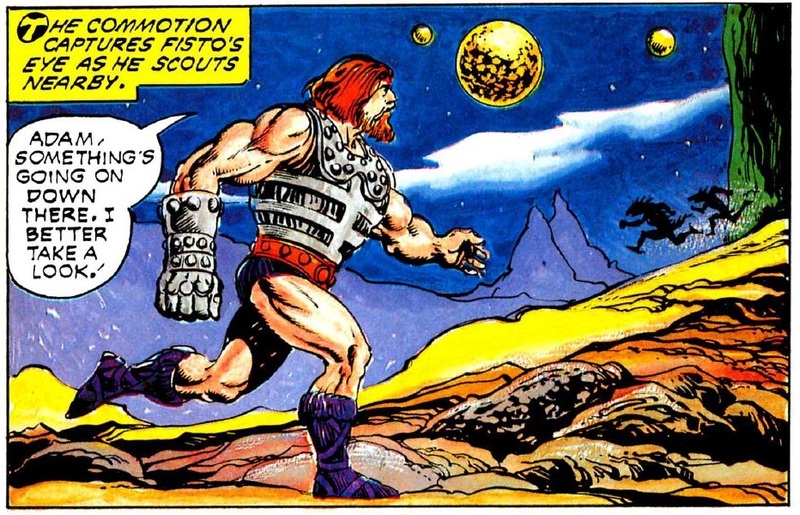 Fisto is also given an origin story. 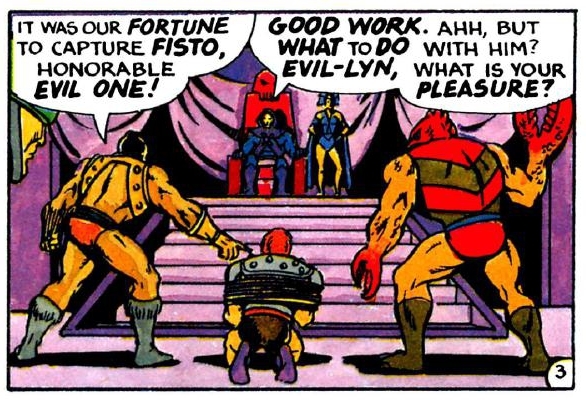 In “Fisto’s Forest”, we learn that Fisto, like Man-E-Faces, started out as a villain. He’s a loner who lives in the woods and makes trouble for anyone he comes across. 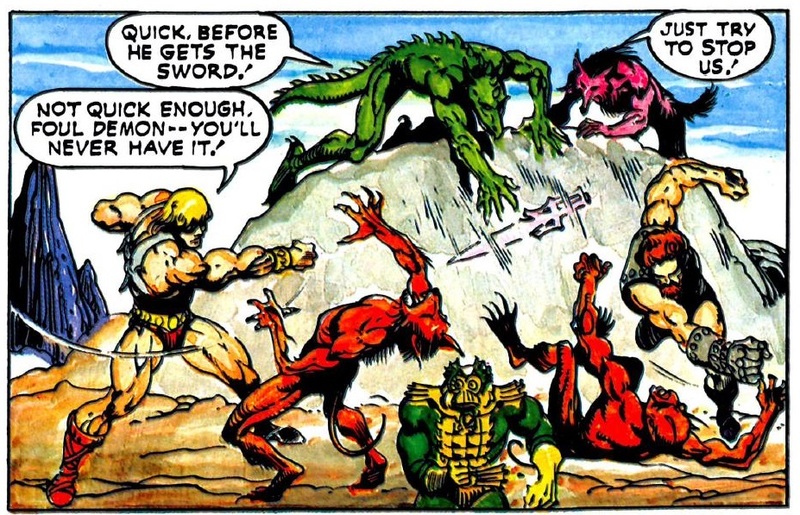 Eventually (and somewhat abruptly) he sees the error in his ways and joins forces with He-Man. 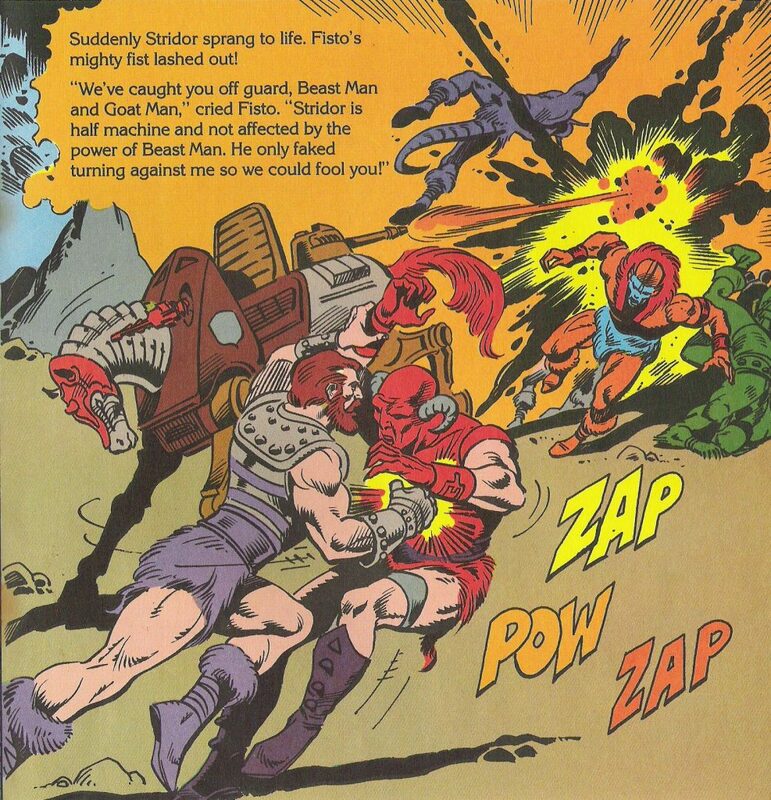 Personally, I remember Fisto best from the episode, “To Save Skeletor.” In the story, Fisto and his compatriots must save the evil warriors (Trap Jaw, in the frame below) from the Lovecraftian demon Sh’Gora. 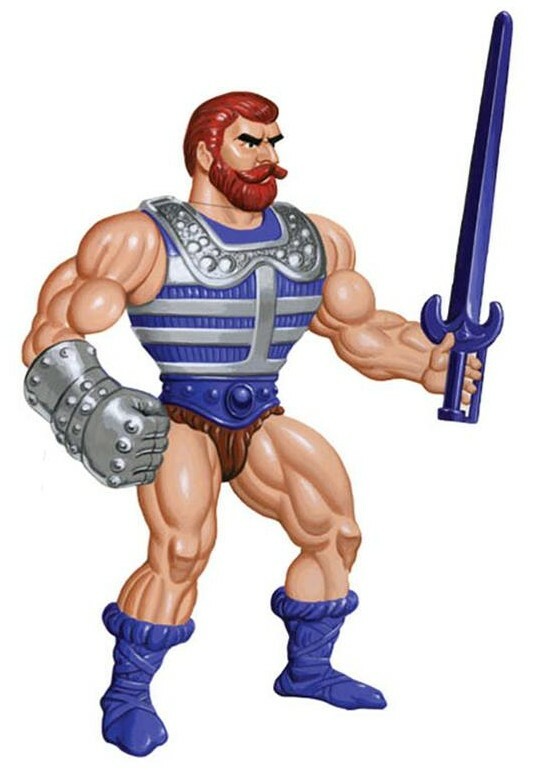 In my mind, Fisto is one of the few heroic warriors who I could see as a leading character in his own spin-off series (I’d say the same Teela and perhaps Zodac). Like most characters released after 1982, he’s a bit gimmicky, but not to the point where he becomes overly cartoonish. 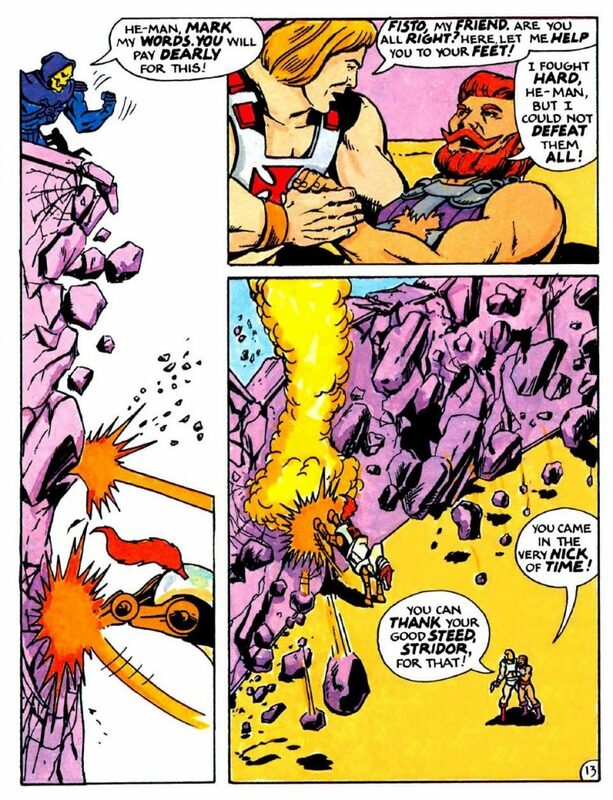 I could see a series of comics where Fisto and Stridor explore the savage wastes of Eternia, challenging evil warlords, winning the hearts of bar maids, and causing lesser men to quake at the sight of his mighty red beard. Fisto. His hairstyle and beard looks so much “80s” (LOL). Seriously, around the time he came out I was wondering why he looked so much like the “dads” around me — minus the muscles and a deadly metal hand ;-). 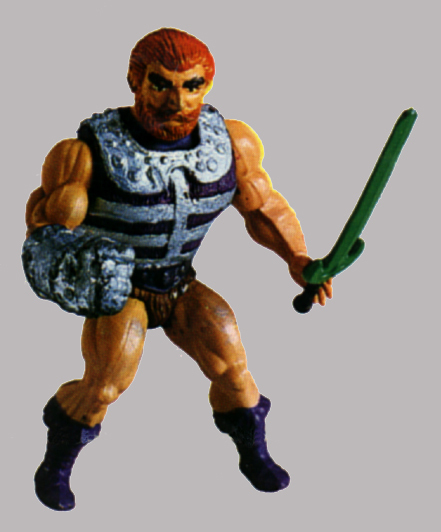 I came to love playing with Fisto as he looked like a Knight to me (the metal fist, the harness, the long sword). Unfortunately I got an Italien/Spanish Version of the figure. The harness would break and the fist itself would losen all the time and eventually break into two pieces (it was dual-plastic). So I could not use his action feature properly. 1980s glue would not fix that Problem either. 😉 Great walk-back-memory-lane post once again! Thanks Wolfstor! I actually know someone with the same hair and beard. I should give him his own Fisto action figure. I honestly never liked Fisto. Rubbing my crystal ball ( no sniggering at the back please ) I can recall that I got Fisto on one of our hoildays to Devon. 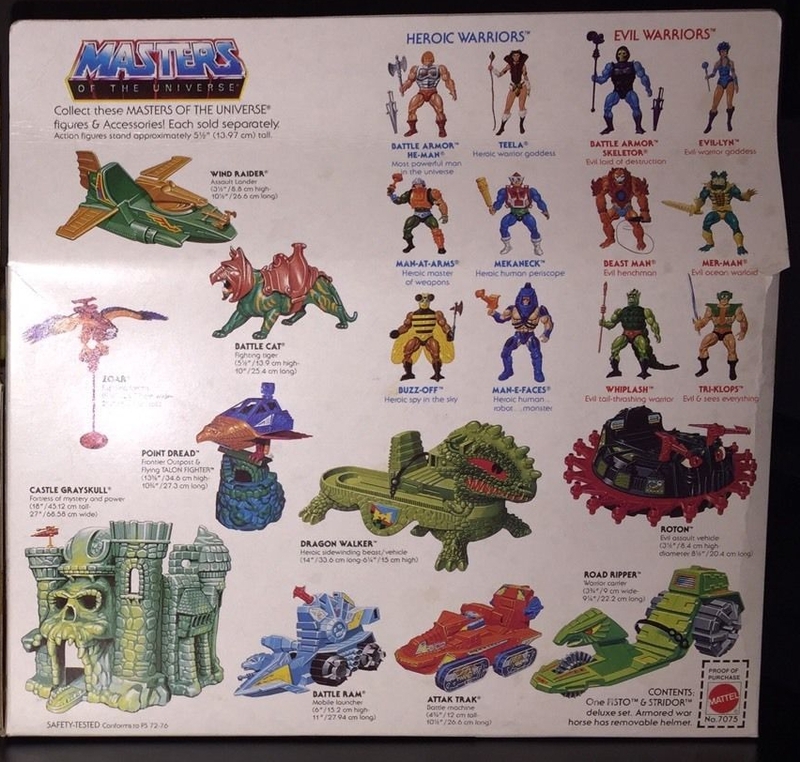 At the time Thunder Cats had just launched so there was a lot of knock off cheap action figures (warriors of the galaxy or some such nonsense) around trying to cash in on the Masters/Thunder Cats craze. 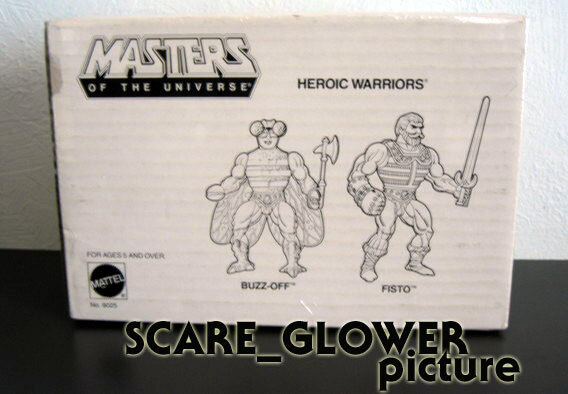 Fisto looked cheap and to me looked to also be a knock off on a Masters blister card. Im sure Fistos head was not rubber but cast in hard shiny plastic which also added to the cheap effect. 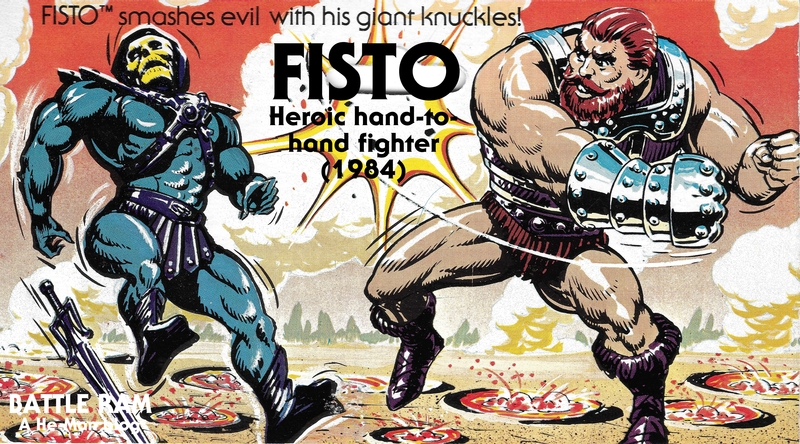 The less said about the name Fisto the better! The 80’s were definitely a much more innocent time! Some of the Fistos out there DO look cheap. My copy looks pretty good though (the one I photographed the most). Regarding the name, I totally would not have gotten the joke in the 80s, But even in the last 15 years or so, the name popped up again in Kit Fisto from the Star Wars prequels and Clone Wars series. Which is why the 200X version had to be marketed as “Battle Fist”. 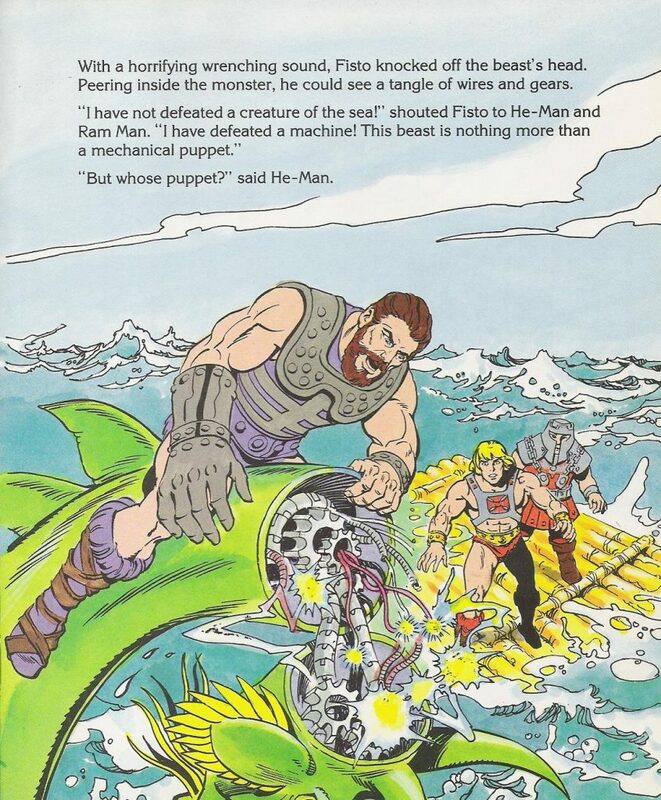 Fun fact: Fisto seems to be treated as He-Man’s second-in-command in the description of the toys in the 1985 Spiegel catalog, IIRC. I never like this figure also, still I don’t, is one of the few figure I don’t own in MOTUC and I could happily live without it. Theres something funny about this character. 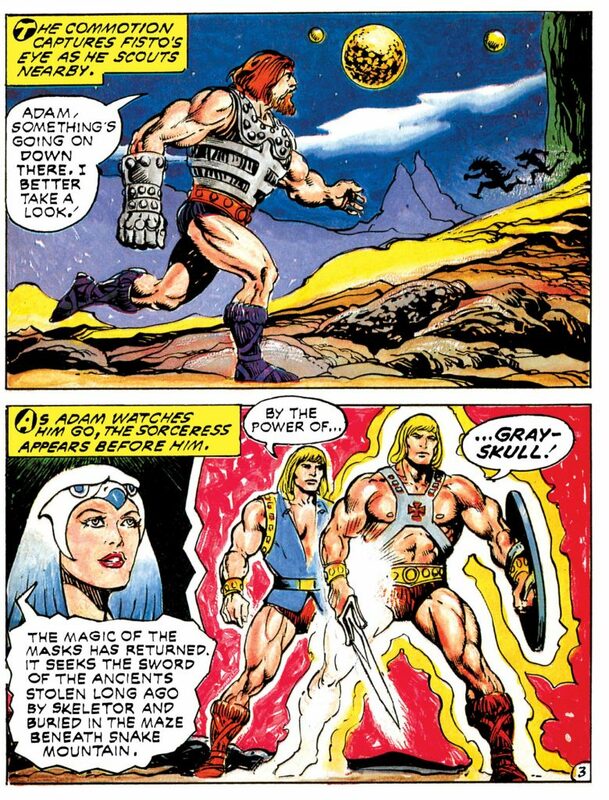 If He-Man is the most powerful man in the universe. 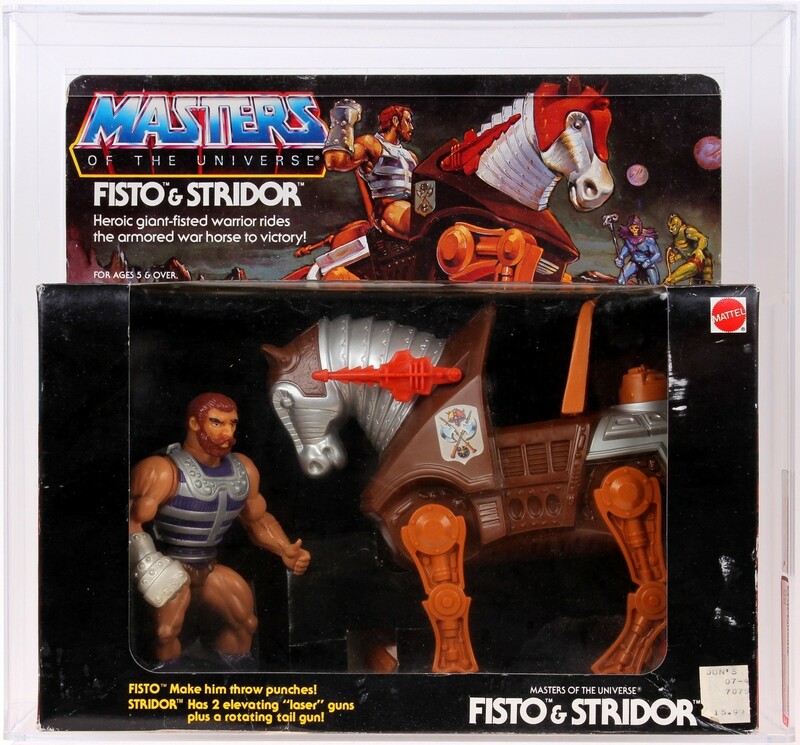 Fisto is #2 in our childhood as He-Man with Battlecat Fisto is with Stridor; It´s like a new He-Man a new main heroe. 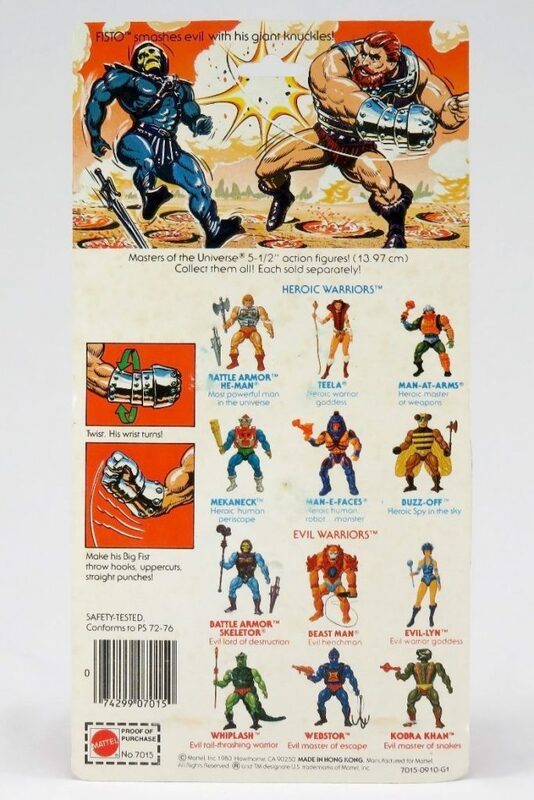 I remember each battle of Fisto and He-Man side 2 side. Fisto 200x of course is better and we can see hisn power in MYP series. 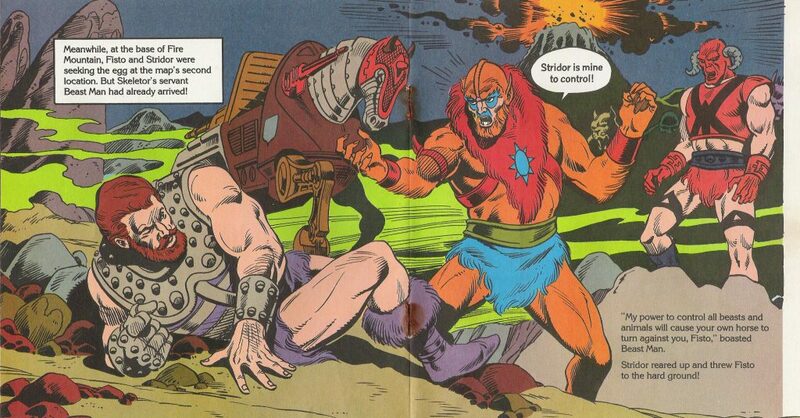 Hey, great column on one of my favorite MOTU characters: FISTO! I was wondering, though, if you ran across anything that indicated Fisto had been designed as having a vac-metalized (“chrome”) fist, like Jitsu’s vac-metal hand. 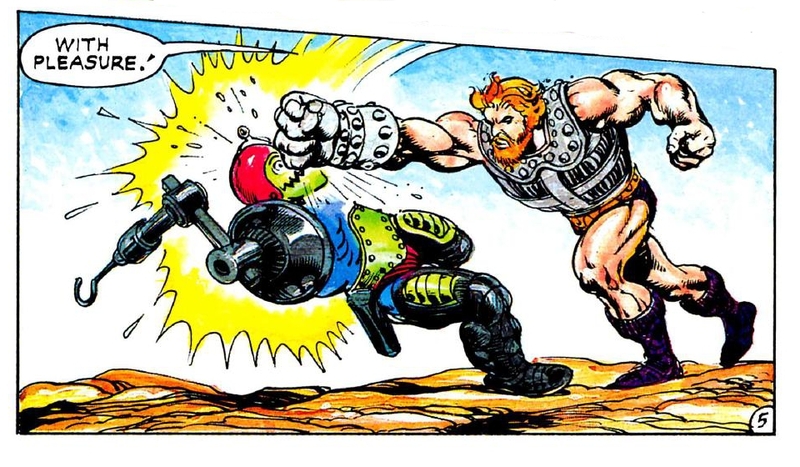 I’ve always wondered, because in some of the art (particularly the art on the back of the card) and in some of the comics (“Clash of Arms”), Fisto’s fist looks like it was meant to be vac-metalized. Thanks! Thanks very much! 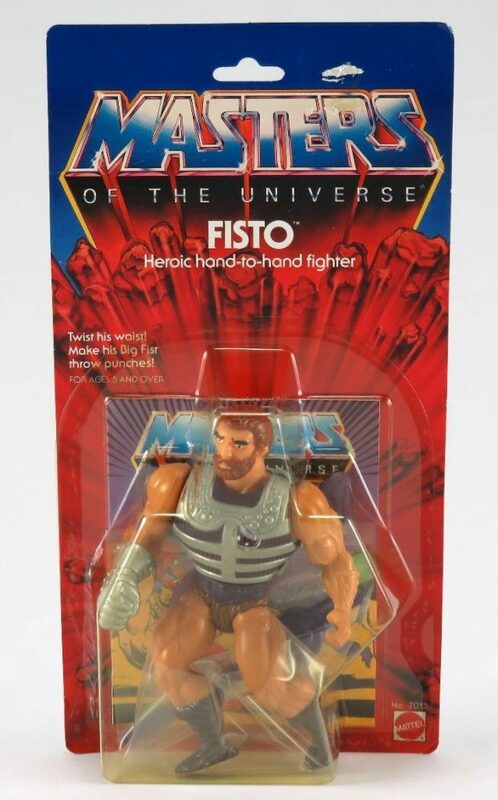 I’ve never run across anything that suggested Fisto was going to have a vac metal fist. Obviously the fist is supposed to look like it’s made of metal. Perhaps the idea of using vac metal didn’t occur to them until they started working on the engineering for Jitsu? 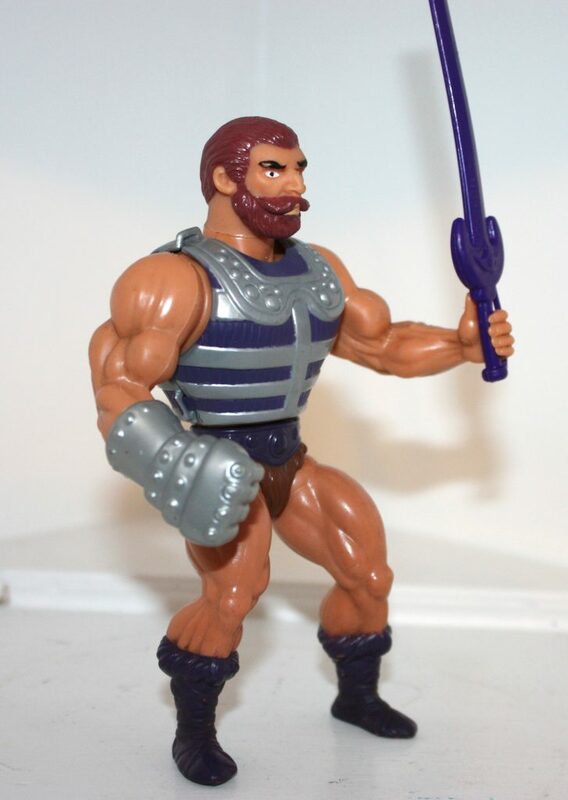 The material they used on Fisto’s fist is somewhat like the weapons that came with Battle Armor He-Man – somewhat metallic looking, more so than straight gray plastic, but not to the extent of vac metal. The artwork on the back of the packaging does make his fist look more realistically shiny. Spring action arm and usual spring action waist made him quite fun. 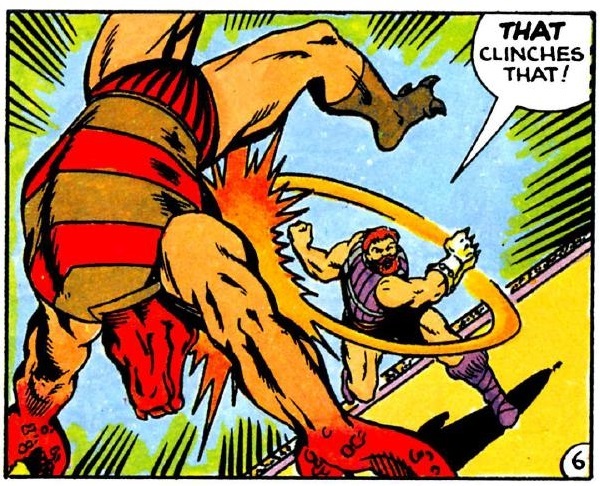 Most of He-Man’s allies seemed like chumps, but Fisto seemed capable to dish out the pain. The card art of him just socking it to Skeletor remains hilarious to this day. It’s also so anti-Filmation/prosocial. Got a problem? Hit it! Troublemaker? Punch him! I always liked Fisto. Aside to look very strong, he is also seemed just a step away to have his own adventures (he is strong enough to hold his own and he has a personal steed, like He-Man). 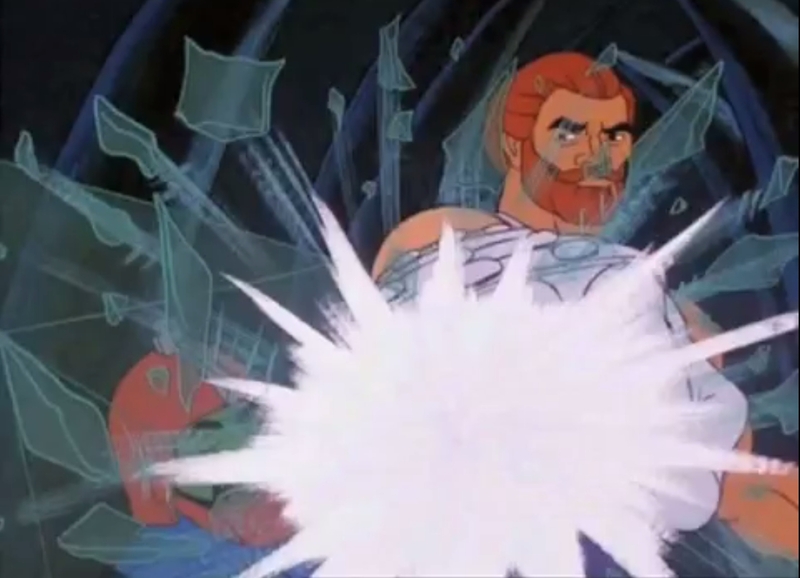 I remember to be very impressed by the filmation episode where he was chosen by the aliens as champion, something like “wow, Fisto must be even more powerful than I thought”. About the weapon, I agree that a sword is a bit pointless for Fisto since he already has a considerable amount of offensive power: personally I think that a shield would be the right accessory for him.